A few weeks ago, my husband and I had the opportunity to check out the new Fall and Winter Menu at Grey Salt located inside of Seminole Hard Rock Tampa. For those who aren't aware, Grey Salt is Marc Murphy's restaurant and you may know him from the Food Network. He is a judge on Chopped and has appeared on a variety of other shows such as Iron Chef America, Guy's Grocery Games, Beat Bobby Flay, Worst Cooks in America, Unique Eats, The Best Thing I Ever Ate, The Best Thing I Ever Made, The Rachael Ray Show and The Today Show among others. Aside from Marc Murphy's busy TV schedule, he is also a restaurateur and we welcomed him with open arms last year when he opened up Grey Salt. 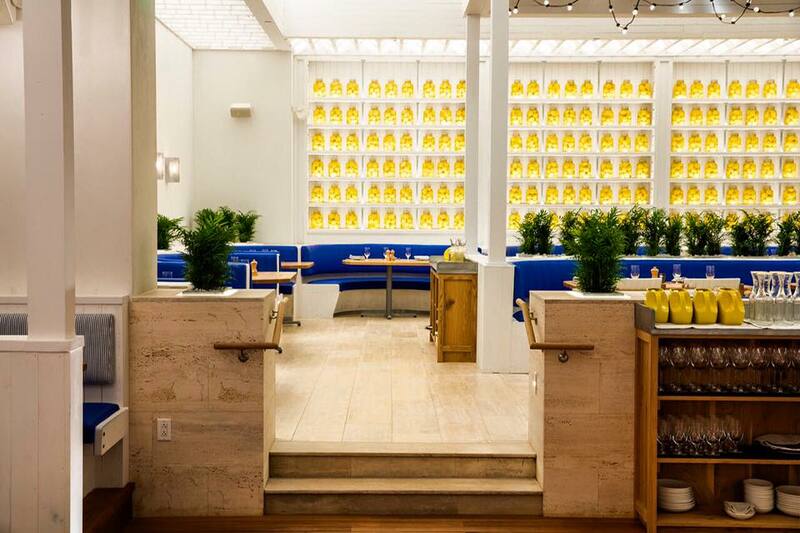 Grey Salt is a Mediterranean Restaurant who gets it's influence and name from Marc's childhood. Marc grew up throughout Europe, predominately in Southern France where grey salt is a household staple. We've had the chance to try a few media tastings at Grey Salt but this was our first sit down dinner. We kicked off the evening with a few appetizers. 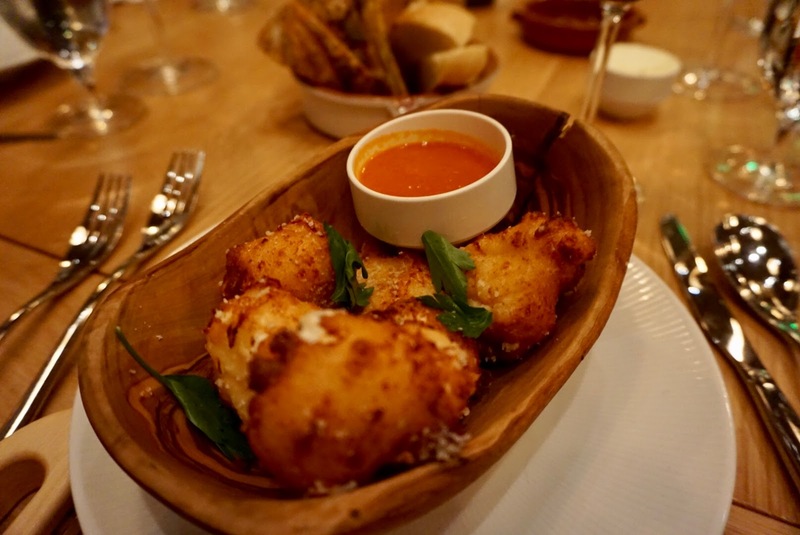 These Mozzarella Fritters were absolutely incredible. The fritters consisted of lightly fried mozzarella with ricotta and Parmesan cheese. This made up to be a very light, airy and cheesy delicious bite. I would order the fritters again in a heartbeat. Up next was Grilled Octopus with cherry tomato, white beans and crispy capers. We first had grilled octopus while hiking Cinque Terre in Italy. Marc Murhphy's grilled Octopus was just as good, if not better, than the grilled Octopus we had on the coast of Italy. A simple yet delicious Wild Baby Arugula salad was just what we needed before heading onto the next courses. With freshly shaved Parmesan and roasted shallot balsamic vinaigrette, you can't go wrong. PASTA! This was our first time trying the homemade pastas at Grey Salt. I am here to say without a doubt, this will not be our last time eating these delicious pastas. I was mildly obsessed with the Chicken Papparadelle pasta above. Papparadelle is my favorite noodle and there is nothing better than fresh Papparadelle. A few folks at our table agreed it tasted like the filling of a chicken pot pie with the fresh veggies and seasonings. I would order this again in a heart beat. While Papparadelle is my favorite noodle, coming in close second is Bucatini. I love the hallow long noodle and we've attempted many times to perfect it at home. I was pretty ecstatic to see both of my favorite noodles offered at Grey Salt. The Bucatini Con Vongole - white wine, clams, garlic and chili flakes. Simple yet delicious. Then the entrees came out with a bang. I truly felt like we were back in Europe with the multiple courses. Up first was Filet Mignon Au Poivre. This dish was cooked to a perfect medium rare and topped with crispy onions and cut like butter. One thing you must perfect if you are on the gulf is Local Grouper and Grey Salt did just that. This was topped with a lemon sauce, almonds and green beans which allowed the grouper to be the main star of this dish. The Glazed Pork Chop was next to hit the table but I could smell the fragrant fennel well before it was placed in front of us. If you aren't a fan of fennel, I wouldn't suggest this dish. With braised fennel, agrodolce (a traditional Italian sweet and sour sauce) and olive oil, this dish was full of flavor. The final entree of the night was Sea Scallops. While scallops aren't my jam, these were pretty good (once I got over the texture). I mean, anything with brussels sprouts and bacon will be delicious right? Grey Salt's Sea Scallops are over a chickpea mash with the above mentioned crispy brussels sprouts & bacon vinaigrette. This is a perfect Fall/Winter dish. Full yet? Imagine our surprise when dessert came out. I could barely look at it. With one eye open, I grabbed a spoon and dove into the Tiramisu. The funny thing about Tiramisu is that Gabe used to hate it. Until we went to Rome, where he was strong armed into ordering it and ended up ordering seconds of dessert. Who does that?! Now he always tries it anywhere we go in hopes to find something similar to what he experienced in Italy. This Tiramisu was really good, one of the better ones we've had in the states. 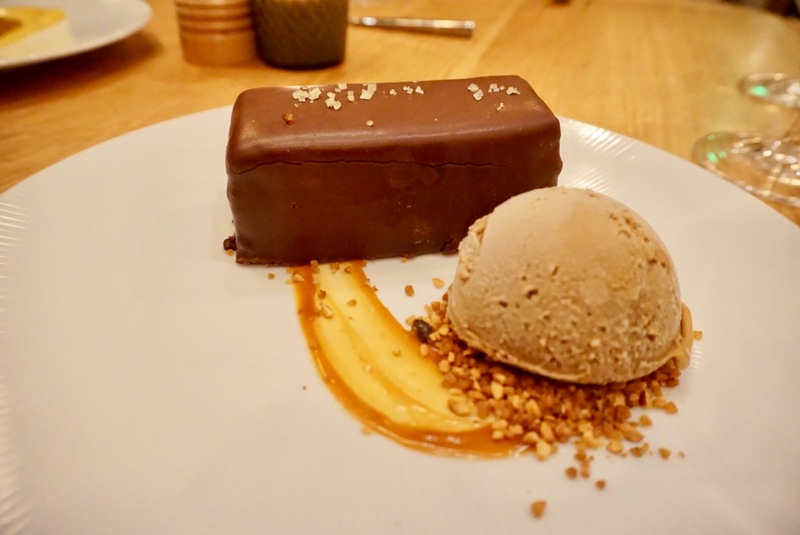 I absolutely loved the Hazelnut Crunch Bar,which was a chocolate covered chocolate mousse and nutella bar topped with coffee gelato. I'm not a huge chocolate fan but this was an A+ in my book. The table also tried two more desserts, which I couldn't eat, even if I tried. I heard rave things about both - this was the Tarte Tatin - with apples and caramel, topped with vanilla gelato. And lastly we have the Lemon Cheesecake - Made with ricotta, lemon curd, hazelnut croquant and seasonal berries. Our meal at Grey Salt was incredible and we look forward to our next visit. I actually won a $200 gift certificate to return back and we are going tonight for a much needed date night! Special thanks to Grey Salt Tampa for hosting us at this dinner. As always, all opinions are my own.